Hindfoot alignment can affect the weight-bearing kinematics of the knee joint in patients undergoing total knee arthroplasty (TKA). This study evaluated the change in hindfoot alignment after TKA by prospectively analysing the correlation between the knee joint and the hindfoot deformity, the post-operative improvement in the hindfoot deformity, and the long-term post-operative changes in hindfoot alignment. 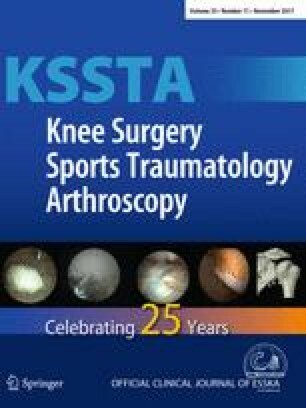 This study included 195 knees from 117 patients with osteoarthritis who underwent TKA between 2012 and 2013. The mechanical alignment angle of the knee joint and the hindfoot alignment angle were measured preoperatively and 6 weeks, 1, and 2 years post-operatively. The patients were divided into two groups according to the severity of the preoperative knee joint deformity: <10° varus (group 1, N = 81) and ≥10° varus (group 2, N = 114). The preoperative and post-operative radiologic parameters of the axis of the knee joint and hindfoot were evaluated, and the results were compared. A Spearman correlation analysis was used to assess the differences in both the mechanical alignment and the hindfoot alignment pre- and post-operatively. After TKA, the hindfoot valgus deformity improved from 5.2° (±3.8) valgus to 2.1° (±3.9) valgus. At 6 weeks post-operatively, the hindfoot alignment angle was 1.4° (±3.5) valgus and 2.5° (±4.1) valgus in group 1 and group 2, respectively; the difference between the two groups was not statistically significant. Hindfoot alignment showed greater valgus with increasing varus of the mechanical alignment of the knee joint preoperatively (−0.484, p < 0.001) and post-operatively (−0.147, p = 0.040). The post-operative 1- and 2-year hindfoot alignment angles were 2.2° (±4.2) valgus and 2.2° (±4.1) valgus, respectively. None of the differences between the post-operative hindfoot alignment angles were statistically significant. The stable improvement in the hindfoot deformity after TKA demonstrates that a valgus deformity of the hindfoot in a patient with a varus knee joint deformity does not require preoperative correction. In patients with a residual hindfoot deformity and pain 6 weeks after TKA, active treatment should be considered because no further improvement can be expected.